No weekday services at Callander or Killearn today. This entry was posted in Rector's Bulletin and tagged Linkage Bulletin, Rectors weekly Bulletin, Richard Grosse, St Mary's, weekly news on December 31, 2018 by Stmary. A number of thanks are due for making these services the success they were. Beforehand, two teams of volunteers led by Carol Seymour (St Marys) and Heather Swain (St Andrews) decorated their respective churches to perfection. On the Saturday at St Andrews there was a ‘spring cleaning’ morning. There was also a cloakroom decorating team. The end result was a transformation. On the Sunday, Fiona Gibson and her team at St Andrews managed the feeding of the five thousand after the Carol Service. An anonymous labourer dug a neat path through the snow from the porch door to the road. For the services themselves, Mary-Clare Brown struggled from her sickbed to mastermind a Carol Service that included two choirs and instruments. Towards its end, George Willis masterminded the opening of the floodlighting scheme. Previously he and others had worked tirelessly to bring the project to fruition. For the first time in some years extra chairs had to be brought in to seat those attending. 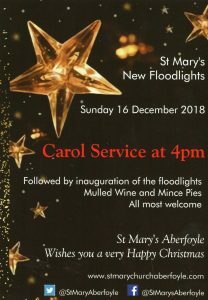 Later at St Andrews, Callander Chorale and Brass led by Margaret and Ian Milligan provided a wonderful accompaniment to the service. All in all, a memorable weekend. The Rector’s deep gratitude to all concerned. No sides persons or readers will be required at either morning service on the 23rd December. Christmas Day sides persons and readers at Aberfoyle required please; offers to Richard. A very Happy Christmas and New Year to all when it comes. No midweek at St Andrews. This entry was posted in Rector's Bulletin and tagged Linkage Bulletin, Rectors weekly Bulletin, Richard Grosse, St Mary's on December 22, 2018 by Stmary. There is a change of service times: see below. Each class at Callander Primary School has contributed towards the production of a Christmas CD at £5 each and the proceeds are towards school funds. There is an order form at the back of church and Amanda Smith will ensure that you have your copy as quickly as possible. No sides persons will be required at either morning service on the 16th December. An evening of festive music including Vaughan Williams’ Fantasia on Christmas Carols and Cecilia McDowall’s A Winters Night as well as the usual favourites for all to sing along. 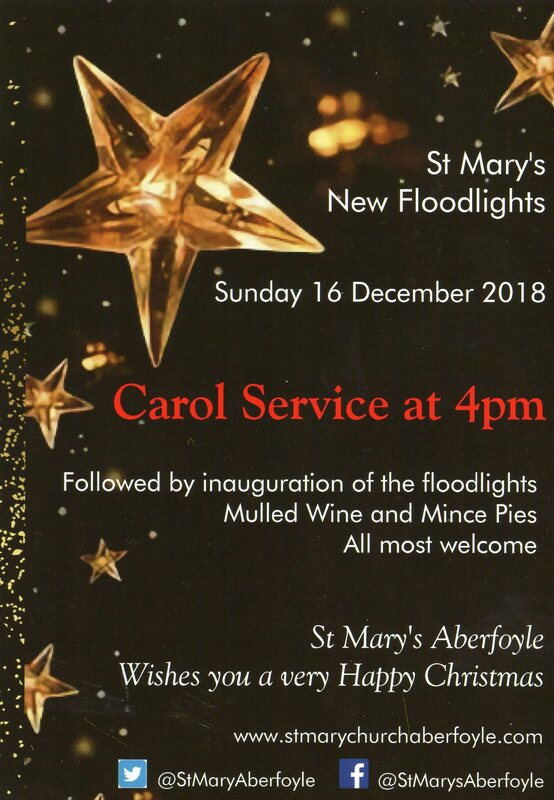 This entry was posted in Rector's Bulletin and tagged Carol Service, Rectors weekly Bulletin, Richard Grosse, St Mary's, weekly news on December 12, 2018 by Stmary.